Meant for aspirants of Civil Services Preliminary and Main Examination, this book covers the syllabus of Indian Heritage and Culture for General Studies Paper I. A wide ranged knowledge base of the Indian, Art, paintings, music, and architecture has been presented with the help of several pictures and diagrams which will arouse the readers interest. There are questions at the end of each chapter which will help students prepare for the examinations. Nitin Singhania, a native of Kolkata, holds a Bachelor's and Master's degree in Economics from Presidency College, Kolkata. He was a chartered accountant and company secretary by profession. He worked in Coal India Ltd. before joining the Indian Administrative Service (IAS) in 2013 and was allotted the West Bengal Cadre. Presently, he is working with the Ministry of Home Affairs, Govt. of India, in the capacity of Assistant Secretary. He is the bestselling author of McGraw Hill's Indian Art and Culture for Civil Services aspirants. Nitin Singhania holds a Bachelor's and Master's Degree in Economics from Presidency College,Kolkata. He is also a Chartered Accountant and Company Secretary. He worked in Coal India Ltd before joining the Indian Administrative Services (IAS) in 2013 in the West Bengal cadre. He has a deep interest and expertise in Indian Art and Culture and is known for guiding students in this area. Presently he is posted as Sub-Divisional Officer in Purba Bardhaman district of West Bengal. Earlier , he has worked as the Assistant Secretary, Ministry of Home Affairs, Government of India and as Assistant Collector in Burdwan , West Bengal. 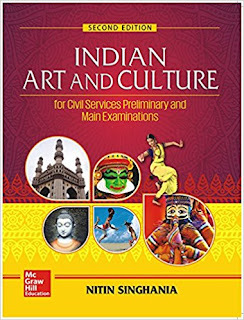 His bestselling title Indian Art and Culture is a favorite among students preparing for the Civil Services Examination. CLICK HERE to buy Indian Art and Culture : For Civil Services Preliminary and Main Examinations Second Edition (English, Paperback) by Nitin Singhania with Great Offers!! !